This dessert was born out of necessity. Or craving. The absolute necessity to eat something sweet one late afternoon. 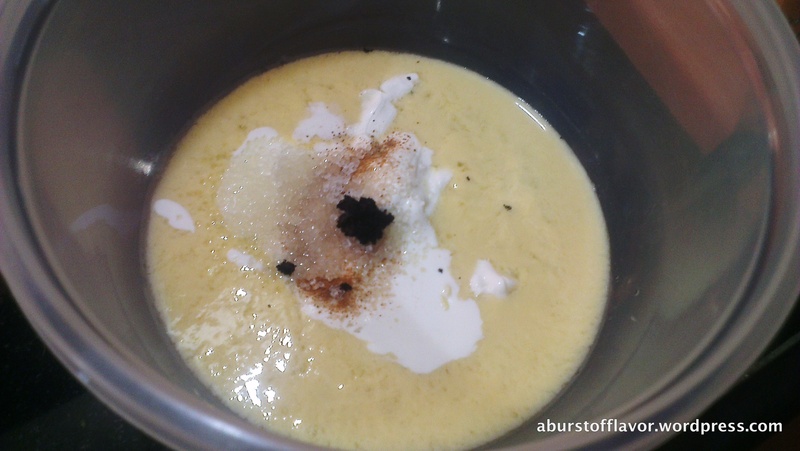 I was craving for something that was pannacotta-ish, after watching re-runs of Master Chef Australia contestants churning out an endless number of fabulous looking pannacottas in myriad flavours on TV. For me, the problem with making a pannacotta is that it uses gelatin to set & we being vegetarians don’t use gelatin due to its animal origins. I was in no mood to go shopping for any vegetarian substitutes that day. So was born this Chocolate cream pot with Melty Yogurt centre! This dessert is nothing but a chocolate cream ganache with a liquid sweetened yoghurt centre. What the yoghurt does, is cut the sweetness of the overall dessert and give you a window to introduce another flavour to pair with the chocolate. It is also a nice touch of surprise to have a runny, flavorful centre in an otherwise firm dessert. This takes only about an hour in the fridge to set. Read on for the recipe! Empty the yoghurt into a mixing bowl. 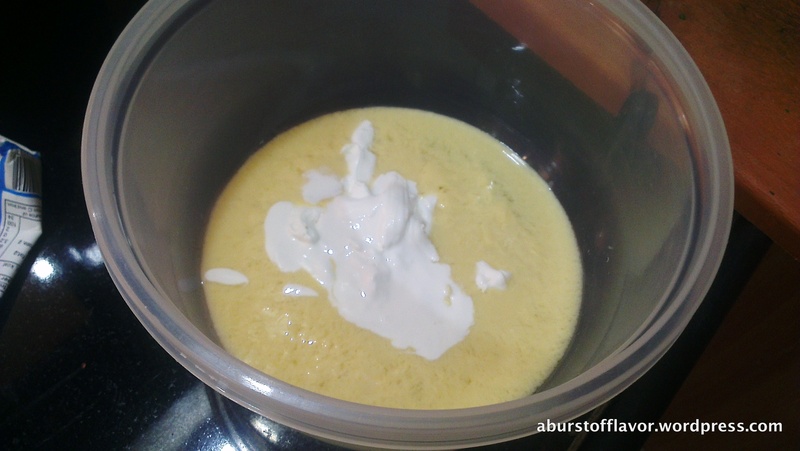 Add 2tsp of fresh cream and whisk until mixed well. Add the vanilla extract, cinnamon and sugar and (if using unsweetened yoghurt) and mix well. Set aside in the fridge. Unwrap and empty the chocolate into a microwave safe bowl. Remember to chop up the chocolate if using bars (to ensure even melting). Melt in the microwave for 30-45 seconds until soft. 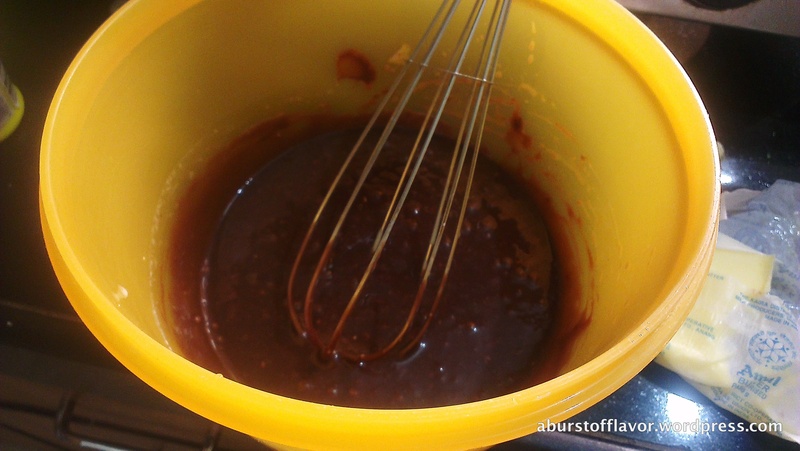 Add the fresh cream to the melted chocolate and combine well. 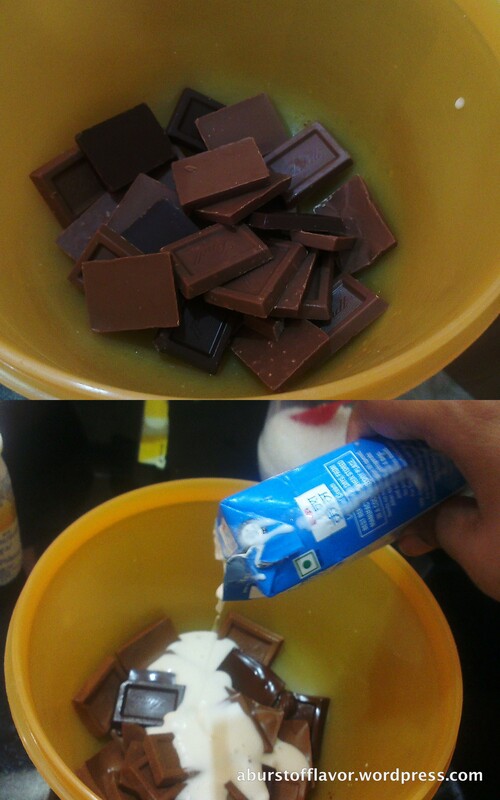 Add little milk if mixture is too thick. At this stage, we should have a ganache-like consistency. Set aside in the fridge. After about 10-12 minutes, remove the glass from the fridge and slowly pour the yoghurt mixture into the centre of the chocolate cream.Since the yoghurt mixture is light and chocolate is dense, the yoghurt will go right in. Set back in fridge for another 45 mins. Garnish with dry fruits like pistachios,almonds or fresh berries you have on hand. I used dried cranberries. If you want to use sweetened or flavored yoghurt for the centre, then please use unsweetened chocolate. 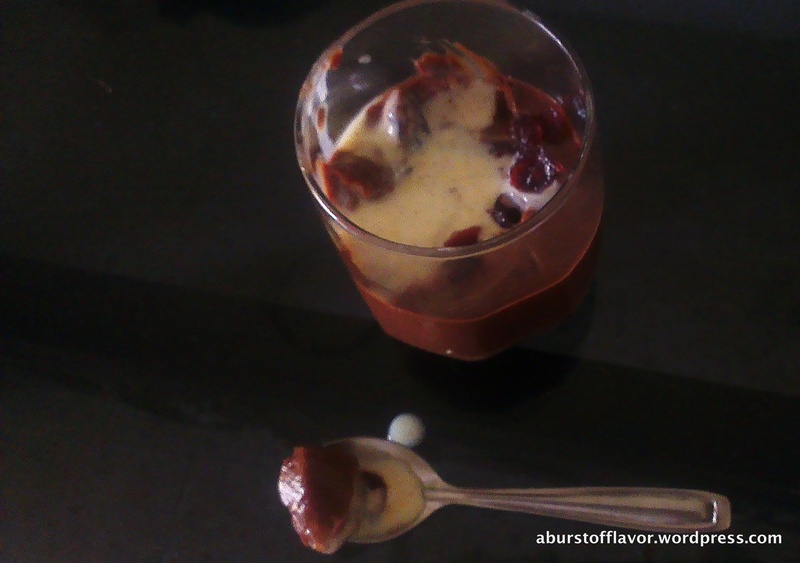 I sweetened my chocolate and used flavored yoghurt which resulted in an overly sweet dessert for my taste. In place of the sugar, you can use condensed milk for sweetness. Use very little quantity while serving, maybe in small shot glasses or mini cups; as this dessert is quite rich because of the chocolate and a few spoonfuls is more than enough to fix any dessert craving.